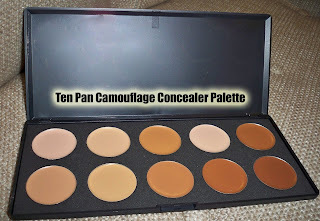 I had the chance to review the 10 Pan Camoflage Concealer Palette from www.sedonalace.com I've seen this product out there on the market as many companies are retailing this palette. I was always a little skeptical to see how well it worked and was excited to test it out so I can tell you all what I really think about it. To see part 1 of my tutorial inspired by Raven of Ru Paul's Drag Race using this palette, as well as a chance to win one for yourself, click here! I received the package in the mail within 3 days of ordering it. I will say that the company definitely knows how to package their products! 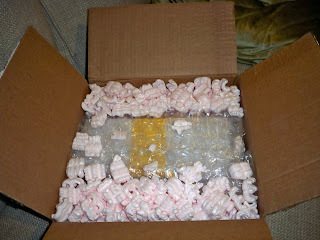 It came in a box filled with Styrofoam peanuts and it was double triple quadruple wrapped. That's What I'm talking about! I've ordered similar type of palettes from ebay and they were shipped in padded envelopes which usually means some kind of damage and breakage. My palette arrived in perfect condition. The palette has 10 shades ranging from light to dark. It's a pretty decent range but if you're on dark end of the skin tone spectrum, you might consider using this as more of a highlight palette. The pans are actually pretty large and contain a thick, cream based concealer. I was able to find the perfect shade for myself by mixing two of the colors. The consistency is pretty thick but not dry like my RCMA foundations. They kind of remind me of the MUFE concealers but maybe a bit thicker. You can definitely thin out the foundation with moisturizer or apply it with a damp sponge to help make it more creamy. I'm actually not bothered with the consistency though because the thickness allows for a heavy coverage for those who need maximum concealing. This product is actually great for so many different uses. It's awesome for aspiring makeup artists on a really tight budget who need something quick for their first couple of gigs. However, while this is great for starting out, I still recommend expanding your kit with professional foundation palettes when you are able to. Also, if you love to do makeup on your friends, this is very convenient. I would recommend it for your own personal use as well...you can use it for concealing and then utilize the lighter shades for highlights and darker shades for contouring. When you get a little more pale in the winter or tanner in the summer, you can add the appropriate shade to your existing foundation to adjust it appropriately. Discount code renren for $4.00 off makes it even cheaper! Also, the code never expires, awesome! Jason from Sedona Lace has generously agreed to sponsor a 10 Pan Camouflage Concealer Palette for one of you lucky readers. Check out part 1 of my drag makeup tutorial inspired by Raven from Ru Paul's Drag Race "Country Western" Episode. I do a full face of drag foundation using the 10 pan camoflage concealer palette. I'd like to win because I have always had trouble finding the right shade for myself. Your tutorial is really great, I learned alot from it. I'd love to receive this concealer because I can never find a concealer that matches my skin tone ever (tanned or not) but it looks like I have a huge range of colours to play with to find the right colour for me! Thanks! I would love to win a palette so I can further my makeup freelancing career. so far i've only done clients that provide their own foundation/concealer or who share the same skin tone as i do but have nothing to match others. I want to be able to provide everything for my clients :)! I'd love to win this I need a foundation palette I never even knew there was such a thing LOL. I love doing my makeup and other proples makeup but foundation is expensive. I always do makeup fir friends and cousins when there's a wedding to go to. This would be helpful. Thanks. I want to win this palette becuz my face was alot of imperfections and this palette will definitely help me conceal them thanks to the thickness consistency! How exciting! I'd like to win because I can never find a foundation with good coverage that matches my skin tone! I'd love to win this because my face is too chubby! I need to slim it down w/ the palette! I would love to win this palette because I have many blemishes on my face that need some covering up when I am at school and when I am spending time with my friends. I also would love to win so that I can practice with highlighting and contouring my face by the help of your youtube videos. I would like to win because it's a great way of having lots of color to match just about any skin color. I also been wanting to learn how to contour so this would be great. I'd love to win this, because it would be great to mix my perfect shade of concealer, since I tend to change shades often. Also because I do others people's makeup (including Drag queens) this would be a great asset to have. And also I live in Atlanta, so it wouldn't be to far for you to ship...just sayin'...lol! I would appreciate the winning the palette because it offers a diversity of colors and uses. I am a single mom on a strict budget and this would allow me to expand my kit. If I don't win, I still plan on buying the palette. I'd love to win because I have a lot of blemishes and dark circles. I could mix my shade as well as other peoples' shades that I can practice on. i'd love to win b/c i'm always on the hunt for the HG concealer! I would like to win because I don't really have anything like this and I can never find the right shade for myself, and I think that it would be super helpful if I got a variety of different shades to mix and match! I would love to win this palette cuz i want to learn more about concealing contouring...Your vid was so helpful and i would like to add this in my collection. Also teach others how to do this....enter me please thanks ;) your fan maria. I would love to win this concealer palette as i have just started playing with contouring and am very excited to experiment. This would be a treasured addition to my kit!! I'd love to win because it seems very multifunctional. It can be used as higlighter, concealer, for contour, and eyeshadow base. I'd love to win this pallete because I can never ever find a concealor to match my skin tone. Having 10 colors to mix and match would be awesome! As I am a newbie in complexion makeup, I would appreciate winning this concealer pallete because this would support my passion for self-taught makeup abilities. After watching your tutorial, I have learned some basic techiques that will help me in contouring and correcting. Also, I am planing to do my own makeup for my wedding and this product will help me for my big day. Thank you. I wouls love to win because I'm trying to start to build up a kit and its so expensive! I' really like to win it because i'v got a huge nose which needs help in covering up and there's a huge variety of shades in this palette which i think is really helpful and it isn't available here in sri lanka. I would love to win this quality product, I have extremely dark under eye circles and lids and because I'm up at this hour watching you, I LOVE MAKEUP! I would love to win so has to try this product and also I want to start freelancing in the beauty world. This would be a great asset to my kit. I would like to win the concealer palette because I am a dance instructor for a nonprofit organization and having this palette will help me a lot when we have our performances. I mainly do all my student's makeup which usually range from about 5 to 9 girls and having this palette with the wide variety of colors will save me from using my own makeup on my students since each of our skin are different colors. But from what I learned from you, it's more of the sanitation issue. I've never understand what the whole point of contouring was until I saw your videos and even if I don't win I want to thank you because now my stage makeup techniques have since grown thanks to you! renren please i want to win because i just got my makeup certificate and i have no money to start working to buy the products,please pick me, thank you. I would like to win because I still couldn't find the right concealer for me! It always turn out to be the wrong shade for me. I would love to win this concealer palette because concealers that I've use always cake up on me an hour or two later. I would like to win because I can never find a good concealer to cover blemishes or anything like that. Plus since i do my familys makeup, it would be a good foundation to use for them. Hi Ren Ren! I would like to win because I am a new makeup artist who is starting my kit and this concealer palette would be really useful for me. I'd love to win this product. I am currently studying Beauty Therapy Sciences and love make-up. I would love to be a freelance therapist and make-up artist, however because I do not have a large range of foundation and concealer shades I have (embarrassingly) had to ask my clients to bring their own foundation; Luckily they were close friends. I would love to save myself the embarrassment of having to ask again for future gigs. I do not get to charge much for my services due to the fact I do not have the different foundation and concealer colours. Which for me, kind of defeats the object of trying to earn extra money while I study for my books and building up my kit. A product like this is fantastic for starting out because of the large variety of colours that you an use straight or mix and match to the clients skin tone. i would love to win because first off i have freckles that i absolutely hate and this could really help me with coverage without having to buy multiple concealers. also like you said, this would be great because i want to start doing peoples makeup. i'm really hoping to be a makeup artist. it's too much these days to buy alot of coverages. so just thank you and i hope that you will pick me! i would like to wi this becuz i hav no concealer and everything cost alot.. and i love your channel on youtube! I'd love to win this cause we don't have this much choice in Italy! I would love to win this palette because it looks great and I don't have a concealer palette yet. wow..! amazing tutorial! !, definitely it's gave me new idea to try this palette. hoping i win this concealer palette to do contouring like you do in your tutorial. I would love to win this because it's an amazing product and gives you good coverage! would love to win this palette..it looks amazing.. I would love this pallet because I think the colours are great, and I love the tutorial on how to use it well, Thank you! I would love to win.because I am starting to use makeup,and i dont have money to buy this palette. (Its pretty expensive) and I would really like to try contour my face like that.its really nice. i would love to win because i just decided that i want to begin to freelance and am trying to build up a starter kit. this concealer palette would be great for doing the first couple of clients/models to start my portfolio. Wow thats cool. I always have trouble finding a good foundation. Im always pulling things out and mixing and its troublesome. So having them all in the same palette is a very good idea. Id love to win won. First off thanks for sharing your thoughts on this product! I'd like to win because as a makeup artist I'd like to get into more contouring and highlighting to add dimension to my client's looks and this palette would be a great product to start out with! i'd love to win, so i can stock up my carrying case for my freelance work. it's hard when you're starting out to buy all the colors for different colored clients, so this would greatly help! Id be grateful to win. This palette would help me so much when it comes to my makeup. Foundations are expensive and i cant ever find one that works for me. Maybe this will. Thanks. Hi Ren!!! My name is India I love watching your videos!!! I would love to win the 10 pan palette because I love makeup and would like to add more to my kit. My friend is getting married in June and she will be my first real gig. I want her to be flawless on her special day.Plus I am a mother of 2 and free is in my budget LOL! !If I win I will practice like CRAZY and hopefully oneday I could be as good as you and some of my other favorite guru's thanks!! I'd love to win because I just used up my current concealer and I'm still on the hunt to find the perfect concealer to match my skin tone. I would love to win this palette because I adore experimenting with make up and how it can change the way we feel about ourselves. It would give me a chance to learn how to contour my face. And playing with makeup is so much fun, it also brings out my creative side. I told myself that 2010 would be the year that I act on my dream of being a makeup artist. It is actually happening, and people are really satisfied with my work, BUT buying an entire makeup kit is really expensive, so this palette would be great for my next gig! I would love to win it! I would love the chance to win this palette to help me build up my kit. I am a free lance artist working in the central florida area, and while I've worked hard to accrue products, face makeup is just so much more expensive. It would be so wonderful and helpful to have a palette of multiple concealer shades that I could sheer out or use for fuller coverage on so many skin tones. I loved watching you use it to sculpt your face, It reminded me of Eve Pearl! Thank you so much! it would be a great addition to my kit. i'm using the temptu wheel and that doesn't have enough shades for use. thanks! I'd love to win because that palette look AWESOME! I would soo love to win this as we don't get such stuff here. It will be a new experience to use this palette. I would love to win this because for months I have resorted to just using eyeshadow to conture because I can t afford palettes like these but I love make up and I make due with what I have and I am tring to go to school for it but can t afford that either.A pot of mac pigments is what it is gonna cost to put dinner on the table for my two little boys. Not a sob story but it would be cool to have something like this for once! i want to win because my skin is hard to match so having this concealer will make my life a whole lot easier. plus i live in a house with three other females and i'm the only one who does make up. it would be nice to have something like this so i can do their face and not just their eyes. I would like to win because i have always been on the look for a great affortable concealer that helps conceal my birthmark on my face but i learned to love my birthmark but just to have a option to conceal would be cool thanks for offering this chance and cool reveiw. I would love to receive this palette because there is such a variety of colors that I could use for myself and for my clients. With the wide range of colors you are able to match everyone even if it's not just one color you are able to mix the colors to make the perfect match! Hey!!! I would like to win this concealer kit because I am really interest in getting into MU artistry and this would be a great addition to my collection that I am trying to build and another MAJOR thing is that money is tight right now!!! I would LOVE to win this because I have difficulty getting the perfect shade of concealer! I would love to win b/c my dark circles seem to never go away and no matter what I use and set with, it always creases into my big ugly lines :( Maybe it's the color, who knows! I would love to win this product because i am an aspiring make up artist with a very limited budget to get started. After losing my job recently i have decided i want to do something that i love instead of settling for something that doesn't make me happy and any little thing that can get me one step closer would mean so much to me. I have been following your channel forever,and you have brought me so much inspiration. Thanks for your consideration. Hey RenRen. I would like to win this product so I can practice contouring and having fun with friends. Soo..crossing fingers. Outside of this contest I just want to say that I love your stelo and your swagger girl. From the way you present yourself, makeup, and products to sharing your love of makeup to us. You rock girl! i would love to win because i started looking at beauty gurus a while ago & found myself always drifting to your channel. This give away would be the perfect gift for me because i want to go to beauty school but do not have the fundings or makeup plus it would show my parents that i am serious about my career in makeup! thanks, your my go to guru!! I would love to win this because i cant really afford concealer that is not cheap and the only cheap ones dont match my skin tone. i love you videos sooo much and i would love to win the pallet. i would also use it and follow you video. all of my friends have expensive makeup and i dont so this would be sooo col if i won! awesome tutorial! i love this style of overdramatic makeup. I'd love to win this because it would make doing freelance photoshoots a whole lot easier. I wouldn't have to go out and buy the subjects concealer every time I wanted to do a shoot. me me me me I would love to win because i just love make up. I would love to win this concealer palette because contouring is essential and alway have a hard time finding everything in one palette at a responsible price. I have recently fell in love with make-up. I am starting slowly with buying different things to build my make-up collection. My next make-up venture is to learn to contour...so please pick me to win because the would be a great start for me...Thanks Angel. I have tried a similar concealer palette from another company and was highly upset when it was not the right consistency. I would love to try this palette as the first concealer in my kit so I can begin doing clients. with this palette I will not only be limited to one type of skin tone. Makeup has no limitation so why should I.
i've always wanted the bobbi brown one but obviously (priced at $225) i can't afford it! i'd like to win this palette because it would be a great dupe! i'm also a new blogger and read your tips on how to become a successful beauty blogger - great tips! come visit my blog if you are interested :)!! thanks RenRen! i would like to win the concealer palette is because i still haven't found the right concealer shade for me. not just that, i love doing makeup on friends and trying out new products, and having this palette would just save so much $ from buying extremely high brand concealers and it would save space in collection and time. thanks for the giveaway! i would like to win this contest because i am like a total beginer at makeup and i have been looking through concealers but never got around to get them so yh and they are al like expensive cuz i wanted the mac one but i really want to win this one!! good luck everyone else and thanks for this contest!!! I would like to receive this palette, because I have alot of sinus problems and have the worse dark circles :( Which basically show through all the concealer ive tried! I also love to contour and reshape my face, and the look! This would be great to have! First Hope all is well! Now, I'd LOVE to win because I'm a Latina woman always on the look out for great concealer(s). It's hard out there! I always watch your videos, you are amazing. Lastly, I don't like my nose so w/the winning product, I'd like to use the palette to contour my nose, cheeks and forehead! Thank you for hosting this giveaway!! I would love to win the concealer palette because I really want to get back into makeup I had my son Kalil in April the best thing to ever happen to me however every woman needs the time to pamper themselves and make themselves feel good. Now that he's a little older I would love the chance to start doing those things for myself hopefully starting with a brand new palette :) Thank you for you time! Hi RenRen! I saw your video on youtube and just HAD to try and win this prize. I've had troubles in the past trying to find a concealer that worked well with my sensitive skin and that matched me well. Even when MA's are helping me find the correct shade of concealer, it always ends up being too light or too dark outside of the store's lighting. The palette would help a lot since there's such a large variety of colours. Hi ren ren, thanks so much for this giveaway.Plus great video on the concealer. I would love to win this product because i always have promblems on concealer, finding the right shade, should i use creame, or liquid. My skin is also sensitive, and some pconcealer give me a rash. Plus i cant afford high-end makeup products, and i have really bad dark under circle. I would love to try out this product and have a fresh looking face. Thanks soo much for this giveaway. I would love to win because its so hard to find concealers that work, and would love to give this a try. thanks! I would like to win because I'm ALWAYS doing other peoples makeup, but a lot of the time I won't have the right shades for foundation or concealer, so this palette would truly be a lifesaver!! Would love to win because I'm just now getting into doing friends makeup and would love the range of concealer to work with! I would love to win this Concealer Palette because i don't have much to work with. No concealer seems to match my skin how i would like it to and i like how i can mix and match with that palette. thank you for this giveaway and thank you for your awesome tutorial on the palette. I deffently learned a lot! I would love to win because my skin color NEVER has an exact match to it. if i won these concealers then i would have the right color (finally!) and it would fully cover my horrible dark circles. Thanks! I would love to win this concealer palette because I want to practice using concealer. I can never find the right shade for my face. Also, I had a recent outbreak of acne and am finally getting over it but I am left with these horrible discolorations on my face and I feel as if that this concealer palette would help cover my problem areas. Thanks a lot RenRen! I'd absolutley love to win this concealer pallet because of the verity of shades it has to offer. I'm a make up lover and I think that palette is absolutely essential for any woman who loves make up. I'd like to win because I can never find the right concealer that works for me. Also because I don't have much makeup. Thanks! I would LOVE to win this!! As I get older, I have noticed that my jaw is becoming less defined. I think contouring below the jaw and chin, as well as highlighting the areas that are still where they should be, would help. I would love to win because I live in Brazil and there's not many stores that ship internationaly, and when they do the shipping rate is so expensive! I love your channel and I would love this product! I really need a good concealer! i would love to win this palette because i just started freelancing and i need some concealers but cant really afford a lot right now. I would love to win this palette because if I could only have one cosmetic product it would be concealer. I never go a day without! I would pick that over gloss or mascara any time. I would love to win because this seems like a must have for any make up artist. enter me. i really want a concealer palette like this. i have a concealer stick but i always buy the wrong shade. I would love to win this palette. My friends usually come to me to do their makeup and this would be good for me. It can also give me a chance to experiment and learn more about makeup. I would like to win this because it's my perfect shade! I mean at least one of them have to be right? i would love to win this because I am just starting out and this would help me do faces and build my portfolio. I'd like to win because my skin tone drastically changes during the season. I'd love to win because it has a variety of colors which is easier for me to find a right shade since i have a hard time finding one. thanks! I want to win cause i love makeup and this palette! I'd like to win because I'm an aspiring makeup artist with very little money and I'd love to own this to start my kit (like you suggested). I would appreciate it so much! I'd love to win bc I dont have a good concealer :( nothing can cover my dark circles..
Hey RenRen! First of all, I love your tutorial on using these concealers as highlighting and contouring colours. It's been a long time since I've seen a good tutorial using cream based colours for that purpose. Secondly,I'd love to win because I am a makeup artist that is just starting out. I have foundation palettes at work, but need something of good quality and affordable for freelancing. If I can try this out and know it's worth it, I will definitely order another! okay. so i would LOVE to win this palette because i definately NEED something like this in my kit. Unfortunately, i have no concealers. i have to make-do with my foundations. and this would really come in handy for my very first gig with a pro-photographer. i am very low materials in my kit and this would help me a GREAT deal! Hi Ren! I'd like to win this product because as a university student, I stay up late almost EVERY night, and the bags under my eyes are really visible. Its not only the bags under my eyes, but the darker shades around my mouth and nose that would need covering too. Concealer would be my best friend, it would not only be a HUGE self esteem booster, but also make me look more awake. As a student I don't have time, nor money to buy expensive make up. Pleaseeee choose me! I love your tutorials and it'd be awesome to win this palette! <3 Thanks! i would luv to win because i can't get such a product in my country ..and i luv anything to do with makeup! i would love to to win becuase i am a current aspiring artist but i am unable to afford to purchase kit foundations and concealers. i have often set aside money to invest in my kit but something always comes up and my kit gets put back to the bottom of the list, this would be a helpful step in the right direction for me! thanks u! First I want to say that I enjoy all of your videos and they have all helped me to further my skills in cosmetology. I would like to win because I have many friends who practice the art of female impersonation all with pallets of their own. I have been practicing on my own face but do not own the variety of textures and colors that they have and my contour doesn't come out as dramatic or flawless as theirs do. I believe if I acquire this palette then I will be able to further enhance my final look when I get into drag. In addition to what was mentioned before there are a lot of people of all different nationalities/ethnicities that stop me on campus at my university and ask who did my make-up. However, when they ask me if I can do theirs I must turn them down because I don't have the appropriate colors for their skin tones. If I was to win the palette then I would be able to practice my artistry on more than one face (mine) and increase my skills with make-up. I'd love to win because I want to try contouring my face like you did ! I would like to win because this give me an opportunity to test a new product that I hear so much about. I'd love to receive this concealer because i love anything got to do with makeups!!! love them all.. from concealer.. foundations.. liquid liner... blusher.. everything!! most importantly.. anything from a guru like u.. love to receive it!! LOVE u renren!! Hey Ren, I would love to win this product due to the fact that I'm a poor college student (I know what a pity excuse right? but it is the most definite truth). So because of the situation I put myself in I must limit myself to the things that i do purchase. This would be awesome if I did get the chance to win. Thank you. I would love to win because I never EVER seem to be able to find the right shade for myself. I have drawers and drawers of completely full drugstore brands because they were too orange, too yellow, too whitish pale, too dark... I really don't understand. It's like even if I buy ever color of a brand none of them work! I'm tired of wasting my limited money. Also, my skin is constantly changing as I tan and de-tan very easily and quickly. I'd like to win because I'm new to concealer and really don't know my shade.